The Indian king has sent his Hindu envoy to Persia together with a chess set, requiring that the Persians work out how the chess pieces move (or the Indians will stop paying tribute to the Persians). 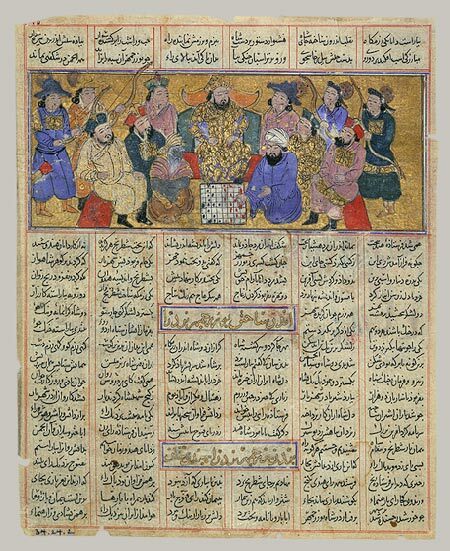 In this scene, Buzurgmihr of Persia (RHS) demonstrates that he knows the moves of chess to the Hindu envoy from India (LHS) in the presence of Shah Nushirwan of Persia. Wilkinson, Charles K. (1943), Chessmen and Chess, The Metropolitan Museum of Art Bulletin, New Series, Vol. 1, No. 9 (May, 1943), pp. 271-279.